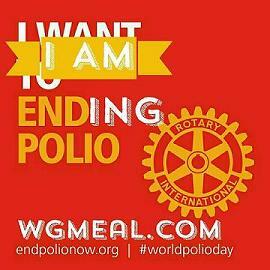 Rotary clubs throughout East Central Illinois are planning a multi-media, public awareness campaign for World Polio Day, Oct. 24. They will be using billboards, newspapers and public service announcements in at least 40 locations. This 5th annual World Polio Day celebrates the birthday of Dr. Jonas Salk, creator of the first vaccine against polio in 1955. District 6490 Governor Larry J. Howell of the Arcola Rotary Club said: "the goal is to increase public awareness of Rotary’s goal of eradicating polio." Polio, or poliomyelitis, is a crippling and potentially deadly infectious disease. It is caused by the poliovirus. The virus spreads from person to person and can invade an infected person’s brain and spinal cord, causing paralysis (can’t move parts of the body). Most people who get infected with poliovirus (about 72 out of 100) will not have any visible symptoms. About 1 out of 4 people with poliovirus infection will have flu-like symptoms that may include: Sore throat, Fever, Tiredness, Nausea, Headache, Stomach pain. These symptoms usually last 2 to 5 days then go away on their own. In 1985, Rotary introduced PolioPlus, a pledge to immunize every child in the world with the polio vaccine and to raise $120 million for the effort. Within three years, Rotary raised more than $287 million to end polio and led the cause to involve the World Health Organization, U.S. Centers for Disease Control and UNICEF. Ten years ago, the Bill and Melinda Gates Foundation joined with Rotary in the fight against polio, agreeing to match every dollar raised by Rotarians with $2. Four years later, the world thought the last case was reported in India and polio was virtually eliminated. However, the wild poliovirus came back in Afghanistan, Pakistan, and Nigeria. So, in June, Rotary agreed to raise $50 million a year for three consecutive years to combat polio, and the Gates Foundation decided to continue its 2-for-1 match. In an effort spearheaded by Fred Heilich, chair of the District 6490 Polio Eradication Committee and a member of the Tuscola Rotary Club, billboards will be popping up throughout East Central Illinois proclaiming World Polio Day. Also, some District 6490 clubs will be collecting money at busy street corners. There are Pennies for Polio collections planned in some schools. If you are interested in participating in this fantastic cause and helping out or donating contact our local Rotary club https://www.facebook.com/mtghrotary/ This event is so crucial to the entire world, and eradicating this terrible disease in our lifetime would be an incredible achievement. Shortly, I will be writing an article on some of the other beautiful ways Rotary Clubs are helping locally and globally.